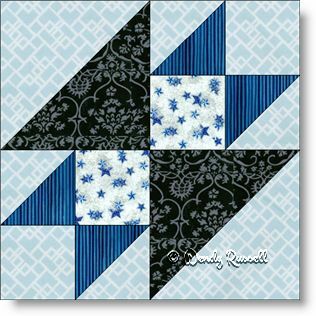 The Anvil quilt block is a very simple, yet effective four patch block and featuring only squares and half square triangle patches. It can be made in a variety of sizes to fit your particular quilt. Rotating the quilt block can produce all sorts of different quilt designs. The two sample quilts shown demonstrate how to take four of the blocks at a time, and rotating each block in the group of four by 90 degrees, to make a new, larger quilt block. By then setting these new versions of the quilt block side by side, a secondary pattern emerges. I see stars. Do you?